Select a shift position appropriate for the driving conditions. While the engine switch is on, depress the brake pedal and move the shift lever. 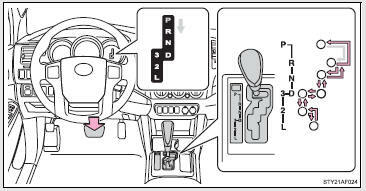 *: To improve fuel consumption and reduce noises, set the shift lever in D for normal driving. 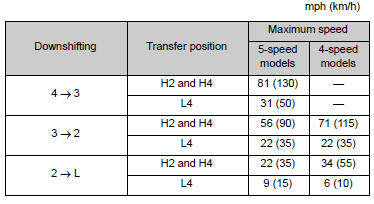 The shift lever cannot be downshifted if the following speeds are exceeded. 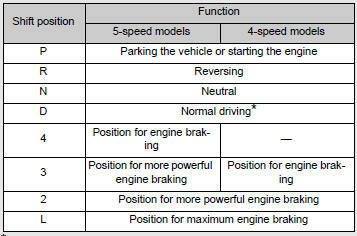 The engine brake will not operate when downshifting from D to 4 (5-speed models) or 3 (4-speed models). AI-SHIFT automatically selects the suitable gear according to driver performance and driving conditions. 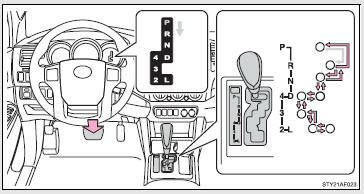 AI-SHIFT automatically operates when the shift lever is in the D position. The engine speed may remain high after releasing the accelerator pedal.